Congratulations: you did it! The academic semester is now concluded, and this means that it’s finally time to drop the books, relax, and focus on some much deserved R&R this holiday season. The feeling of handing in your last exam and walking through those doors toward academic freedom truly is a beautiful one. While it seems like Thanksgiving break wasn’t all that long ago, the stressful academic push between Turkey Day and the end of the semester definitely takes it out on the average college student. If you’re feeling like your brain is just about ready to blow, don’t worry, because that’s practically to be expected at this point! We’re sure that you’re ready to leave our apartments in Kent and head back home for the holidays, but Kent’s Best Apartments is also sure that you want to get the most out of winter break. Whether that means you’re sleeping in every day or going on multiple skiing adventures, read below for some great ways to truly enjoy your holiday break. If you went out of state for college, or even just across the great state of Ohio, then you’ve probably missed some old friends. Given that it’s the holidays, they’re probably back in town as well. 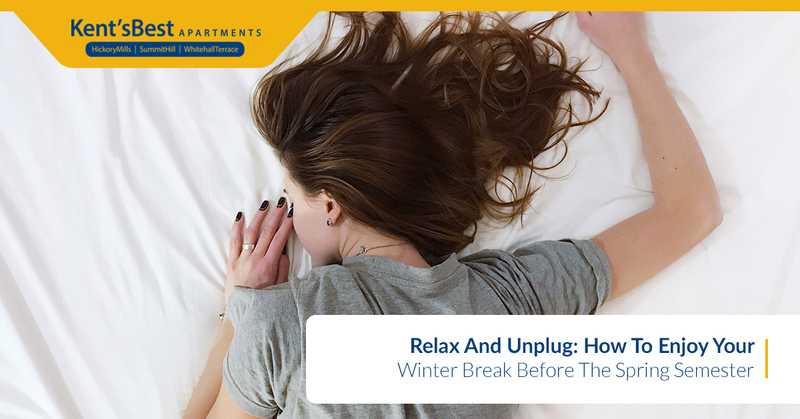 So long as you’re getting in some quality time with the family (that’s probably where you’re staying anyway), reach out to your buddies before you leave Kent and create some truly unforgettable memories during break. The college experience is fun during the academic semesters, but that doesn’t mean you can’t enjoy yourself during break! There’s a big difference between sleeping in knowing that you’ve slept through multiple alarms whilst forgoing your academic responsibilities, and sleeping in knowing that you have zero obligations for the day. Those days are the best, right? There’s no sense getting a jump start on next semester’s homework because you’re just going to burn yourself out. Take advantage of this special time period and just enjoy yourself. Sleep in, be lazy, and don’t feel guilty about it. You’ve earned this! Yes, we did just recommend to be lazy and do next to nothing during break, or at the very least, whatever your heart desires. However, since you’re around for the holidays, it’s important to know that your parents probably appreciate your presence more than you realize. After all, you’re their collective pride and joy, and they successfully raised you and sent you to a good school. Now you’re back, and they probably want to hear all about it! Be available when you can. Hang out with your friends, but don’t neglect family dinners or outings with your folks. If your folks are helping you through college, it’s the least that you can do. Kent’s Best Apartments Will See You Next Semester! As always, we’d like to thank our readers for stopping by our blog. Questions about our Kent apartments moving forward into the next academic semester? Drop us a line at any time here. Happy holidays!